Today's quick and simple bento was just using food cups, food picks, baran and cutter. The food cups are very handy to use to make characters. No need to decorate the face parts, the food cups had already done it for me. I just needed to make onigiri molded by hand and used cutter to make hands. I put everything on the top of the rice, layer by layer. I put rice at the bottom layer, and then stir fry cabbage, crunchy bacon and ikan bilis / anchovies. I added some sweet corn kernel too. We love to eat rice just with these ingredients on the top. The sweetness of cabbage and corn combined with the crunchy bacon and salty ikan bilis are just perfect. Don't forget to link your bento to "What's For Lunch" at Shannon's blog. You can still submit it, so please hurry share your bento with others!! Omg, so cute and clever of you to use the food cups! @hapabento : So sweet of you to say that. Thanks a lot Deb! Lia, you are genius. I love to use picks and baran for easy cuteness but never thought to use the bottle caps! The rice layers sounds delish! Yummy! @Indonesia Eats : hahaha ... Thanks a lot Pep! wow that rice does sound yummy! How do you stir fry the cabbage? In oil? I have never done that before. 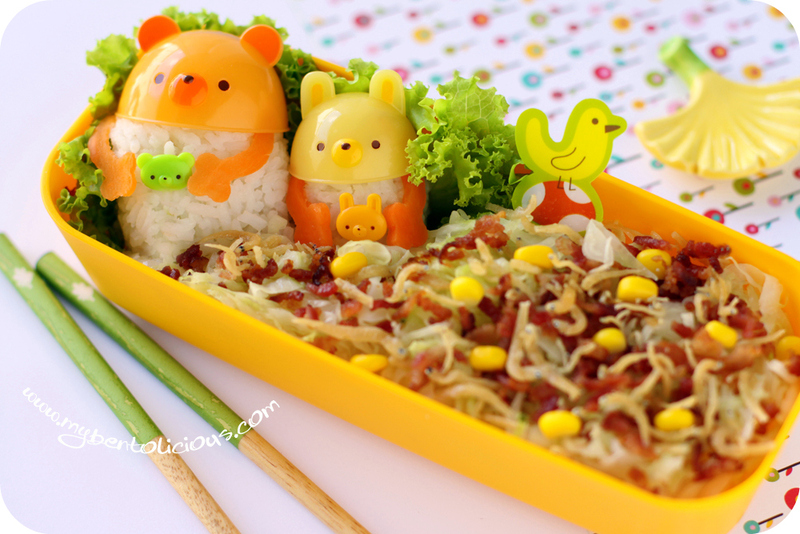 you are a genius in making cute bentos.. thanks for giving us ideas of using food cups.. and your ikan bilis looks so crunchy and yummy..
What a great idea with the food cups. Are they the tops to cups? wow, that salty/sweet rice topping sounds yummmmmmy! never would have thought to put rice inside the bears (normally would think of using them for sauce or furikake), what a smart idea! and this photo is styled beautifully, from the pretty gingko leaf to the lovely patterned paper and chopsticks. you are a MASTER of prop styling! !